I am a child of the 80’s. I feel like my generation was spoiled with some of the radical and awesome items that still impacts our lives now. As a kid growing up in that decade we had shows like Masters of the Universe and Transformers. Movies that still rules our world like the Star Wars trilogy and Ghostbusters. In the world of gaming we were introduced to the home video game systems like the Atari 2600. Loved playing Pac-Man and Defender. Even with the systems like Atari my friends and I still made it a point to meet up at the arcade. Take one moment before you read any more of the article to remember your favorite arcade. What did it look like? Do you remember all the bells and whistles that to some sounded like noise pollution? Not for us gamers. It was a melodic symphony to me and my friends. We saved some of our allowance money to play at least a few games at our local arcade. Even if we weren’t playing we still enjoyed watching our friends destroy buildings in Rampage or taking down buzzards while they were controlling an ostrich in Joust. We all took turns waiting for that moment to beat the game or at least be lucky enough to put our initials on the leaderboard. If you got your name on the leaderboard you had bragging rights for at least a week. The arcade was our home away from home. Even now as my friends and I got older we still have a love for video games. The next gen systems are great, but I do miss those times at the arcade. That was until Arcade1Up came along. They made my generation have all the feels when they released the news that they were coming out with arcade units that would be perfect for your home and not break the bank. Over the years I would scour eBay and other auction sites for an arcade unit for my home. The game units were either too expensive or was in such bad shape that you would probably only get a few games out of that system. Now with Arcade1Up you get that feeling of playing at the arcade in the comforts of your own home. The price point makes it an easy sell. You can’t get that quality of an arcade unit for that price anywhere else. 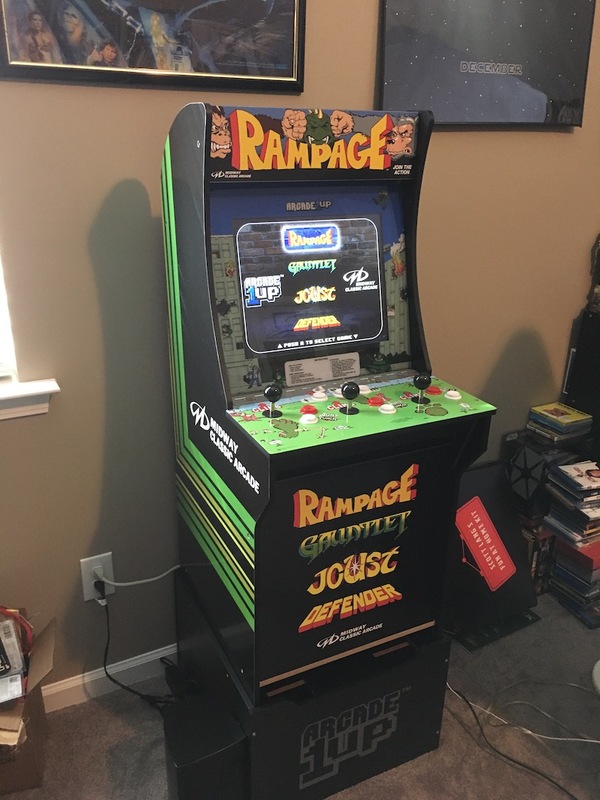 I recently got the Rampage arcade unit from Arcade1Up and I immediately went back to my childhood. I was beyond giddy! Plus I had to share the news with my friends. The lucky ones are my friends that live near me. I told them that they needed to come over and try the game out. Needless to say my friends were just as excited as me. We started texting stories of our favorite moments in the arcade and setting up a day where they would come over and play. One of my friends started checking out the Arcade1Up site to decide which game he would pick up. As I was putting the kit together I was thinking about all the fun that was in store for me and my family. My daughters both let out a collective “Whoa! What is that?” when they saw the Rampage unit. After a quick story down memory lane I showed them what the games were all about. Yes….I said games. 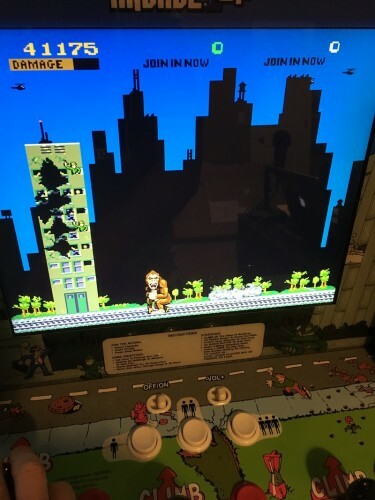 Arcade1Up just doesn’t give you just one game. Nope! 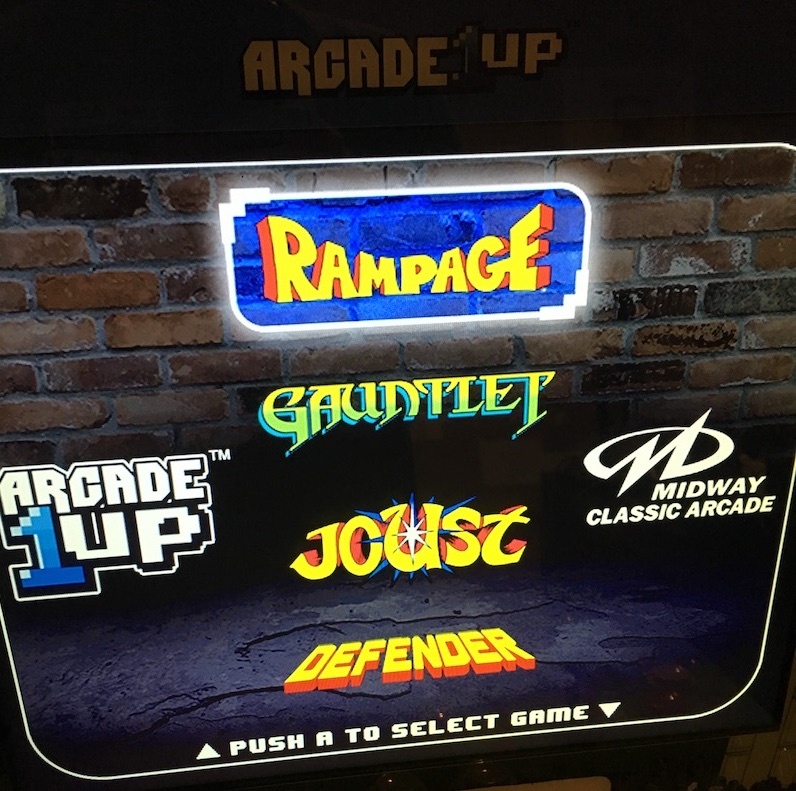 The Rampage unit comes with four games: Rampage, Gauntlet, Joust and Defender. All four games are legit in the Arcade1Up unit. The sounds, controls and graphics are the real deal. I loved sharing my childhood pastime with my daughters. I explained about the good times with my friends at the arcade. They enjoy playing the games just as much as I do. I have the arcade unit in my office and every time I glance at it while working I start to smile. One of my childhood dreams was having an arcade game in my house. Now I feel like Ricky Schroder’s character, Ricky Stratton in the 80’s show Silver Spoons. He had all the cool toys in that house. He had a few arcade units in his house on that show. If you are looking to upgrade your office or game room the Arcade1Up machines are a sure bet. There are over five game title units for sale now and rumor has it that next year they will be expanding their inventory with new games. My hope is that they get a Mortal Kombat unit up for sale! That would be OUTSTANDING! To my fellow gamers and 80’s kids go to arcade1up.com to relive your youth and bring home some of your favorite childhood memories. Please Note: Arcade1Up sent me the Rampage arcade unit, but my thoughts are my own.